Edge Desserts: Gingerbread House - Edge Desserts Style! Here's a holiday treat for you. 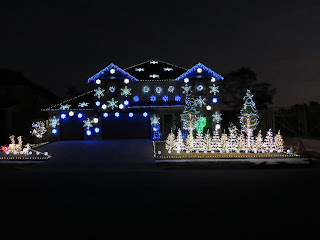 Just before Thanksgiving, I took my kids and my mom to see some Christmas lights. The house that was featured on a local television station's facebook page so we thought we would go check it out. We were there, with a television crew and about 20 other people. This guy did an amazing job and it was the perfect way to kick off the holiday season! Little did we know that same house/video light show would go viral.... It has been featured on CNN, NPR, The Today Show, and so many others. They can also be found on Facebook at https://www.facebook.com/ListenToOurLights. While the featured song on the television station was a synchronized light show to "Gangnam Style".... it was about 30 minutes of pure magic. Inspired by their amazing light show, we decided to do our own "Gangnam Style" gingerbread house. WoWWWW! This is so amazing. My whole family lost it with excitement watching this video. Thanks so much for doing this. ...and it lights up and everything! !